[T]onight he said that he knew "some writers from The Office" were taking a stab at the script right now (which we already knew) and that he thinks that's a good start. He paused for a few seconds then said that he thinks enough time has passed and that "the wounds from Ghostbusters 2 are healed" and that he would definitely be into doing another Ghostbusters movie, stating that the first 40 minutes of the original film is some of the best stuff he's been associated with and the whole shoot was an amazing amount of fun. He also went on to say that his enthusiasm for Ghostbusters was heightened after recording the voice of Peter Venkman for the video game over the summer. 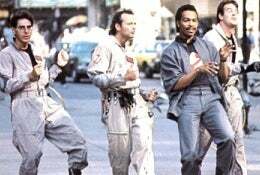 In fact, he said he found himself walking down the street singing the Ghostbusters theme song and then thought people walking around him were going to start yelling at him to "get over yourself, Bill," so he stopped... But the enthusiasm was there.